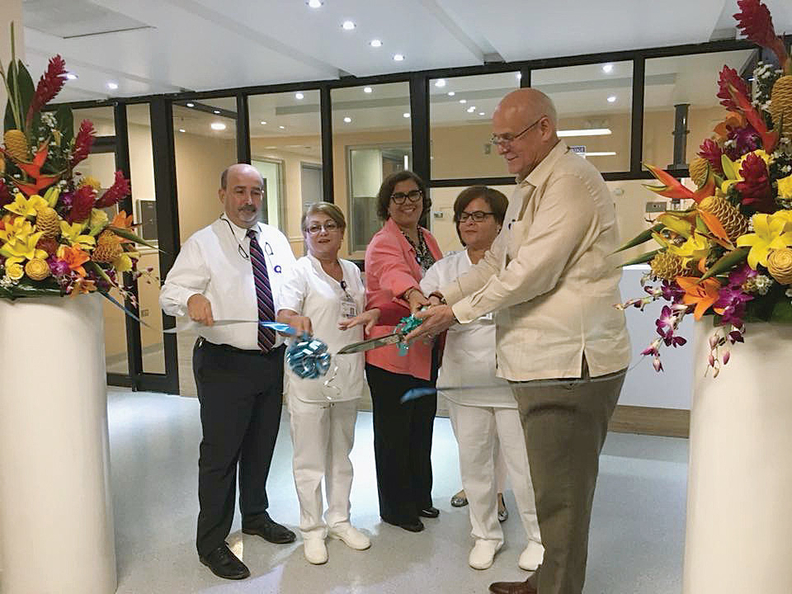 Ryder Memorial Hospital Executive Director Jose Feliciano at a ribbon-cutting ceremony to mark the re-opening of the hospital's second floor surgery unit, which has remained closed due to damage it sustained from powerful winds and rain brought by Hurricane Maria on Sept. 20, 2017. Roughly a year since Hurricane Maria ripped across Puerto Rico, the island's healthcare infrastructure appears to still be years away from recovery. The storm caused one of the longest power outages in recorded history, displaced thousands of people and caused enough damage that some hospitals remain close to the condition they were in weeks after Maria hit. Recovery efforts have been hindered by a less than robust federal response to the emergency, with hospitals in some of the island's hardest-hit areas still not operating at pre-storm levels. Ryder Memorial Hospital in Humacao is one example. Before the storm, the acute-care hospital in the southeastern part of the island operated on five floors and had 165 beds. Until recently only one floor was open. 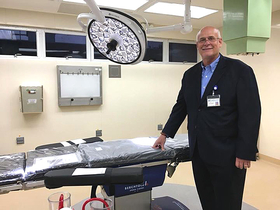 “We open our second floor this week,” Jose Feliciano, Ryder Memorial's executive director, said in late August, with the floor adding 64 beds and eight operating rooms to the hospital's current capacity. Because of extensive storm damage, four of the hospital's five floors remained closed in February, and it had just 40 beds. A year after the storm hit, Feliciano said Ryder has had challenges in receiving reimbursement for its losses, which he estimated at $24 million. The hospital has had no financial support from the local or federal government and continues to fight with its insurance carriers over the amount of a final settlement. He said the situation has just added challenges to the already difficult task of preparing for another possible disaster this hurricane season. Calls to the Puerto Rico governor's office as well as the Puerto Rico Department of Health were not returned. Michael Cavanaugh, sustainability leader for global design firm CannonDesign, said part of preparedness planning is accepting that disasters such as hurricanes will be more common, and that a facility must plan beyond the safety of its own walls to have an effective response. “What happened in Puerto Rico, not only with buildings losing power and losing access to clean water but roads being unacceptable, and infrastructure being totally wiped out, vulnerable infrastructure needs to be part of the purview of hospitals,” Cavanaugh said. Cavanaugh said providers in states that he has worked with have taken emergencies into account when building or rebuilding structures so they are capable of withstanding the short- and long-term impacts of a disaster. Some of those designs have included alternate power sources like solar panels in the event electrical power lines go down and generators fail. 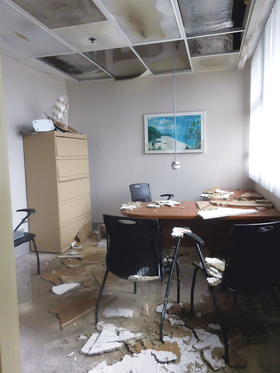 An administrative office located on the fifth floor of Ryder Memorial Hospital in Humacao, Puerto Rico that suffered extensive damage as a result of Hurricane Maria. The challenges that providers like Ryder continue to face have fostered conditions that leave Puerto Rico's healthcare system in some ways less prepared for another major disaster than it was last hurricane season. A number of public health concerns have emerged in the aftermath of last year's storm, including a stark rise in mental health disorders such as depression and anxiety, increased risk of infectious diseases, and a growing burden from unaddressed chronic disease care needs, all of which are exacerbated by continued limited access to healthcare and medications. Such factors, combined with an exodus of healthcare professionals that only accelerated after the storm, has contributed to making the island's health system more vulnerable to another large-scale emergency. Levis said her firm is surveying households in 20 municipalities to produce needs assessments for seven community health centers. Preliminary data indicate social factors have worsened in the months following Hurricane Maria. She said healthcare providers have shown in recent months that they are more cognizant of the need to address social determinants to improve population health. Issues such as lack of transportation, food insecurity, and housing instability were all problems prior to the storm, but they've only gotten worse and led to a humanitarian crisis responsible for thousands of deaths. In August, a study conducted by researchers at George Washington University's Milken Institute School of Public Health at the behest of the Puerto Rican government estimated there were nearly 3,000 excess deaths in the six months following the time Hurricane Maria made landfall last September compared with earlier periods. The new figures prompted the government to revise its official count of the number of deaths caused by the storm, which they previously reported as 64. But the rise in mortality in the aftermath of Hurricane Maria is only part of some of the short- and long-term health challenges many of the island's residents face. Health outcomes among Puerto Rico residents were a concern prior to the storm. Rates of infant mortality were 7.57 deaths for every 1,000 residents in 2015, according to a 2017 analysis by the Urban Institute, compared with 5.8 per 1,000 in the mainland U.S. Cancer, heart disease, diabetes and Alzheimer's disease were the leading cause of death and reflect an aging population where nearly 20% of residents are age 65 or above. Levis said the prevalence of such chronic conditions has only grown after the hurricane, and the unmet need for health services throughout the island has increased. As of June 30, more than 1.6 million of Puerto Rico's population of 3.4 million were living in designated primary-care health professional shortage areas that are in worse shape than is typical. Less than 2% of health needs are being met in those areas of Puerto Rico compared with 48% of needs being met in such shortage areas nationally, according to the U.S. Health Resources and Services Administration. Levis said boosting the island's ability to attract, or at the very least retain, its healthcare workforce would be a big step toward improving its emergency preparedness. Over the past decade, many healthcare professionals have left for the mainland U.S., where they can find higher pay. A fiscal report released in April by the Puerto Rican government projected the impact of hurricanes Maria and Irma would cause an additional 600,000 people to leave Puerto Rico by 2023, compared with over 300,000 who left in the past decade, with the majority being young professionals such as doctors and nurses. The declining population's impact has been twofold for the island's health system. Not only are there fewer skilled health professionals, but many of the remaining residents are elderly or too sick to leave, putting an even greater burden on healthcare providers. Levis said a big contributor to the exodus of medical personnel has been the lack of parity between Puerto Rico's Medicaid reimbursement rates and those in the states. Roughly 49% of the island's residents are covered by either Medicaid or the Children's Health Insurance Program, yet those programs have historically received less money than their counterparts in the states. As a territory, the island gets a fixed federal match rate of 55%, while state rates are based on per capita income. Congress passed a budget bill in January providing Puerto Rico with 100% in Medicaid federal-matching dollars through September 2019. But many argue for a more permanent solution to secure the funds needed to address current health challenges as well as to help providers prepare for future health emergencies caused by disasters. Levis said various organizations have taken it upon themselves to carry out emergency preparedness planning for the island's healthcare network. Groups such as the Puerto Rican Hospital Association and others have been meeting to work out a more unified approach toward emergency response. 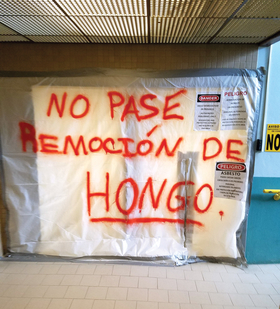 Historically, Puerto Rico's hospitals have had to develop their own plans for responding to a disaster, which may or may not have incorporated coordinating with local first responders or federal disaster relief efforts. Dr. Richard Logue, executive vice president of physician staffing firm Envision Physician Services and an experienced emergency planner, said the best plans are ones that are simple to follow in times when unexpected things occur. “In an ideal world, when those unknowns do come up, the people who are best prepared are the ones who know what that command structure is going to be, who's going to be in command, where the supplies are going to come from, and (the plan) lays out very simple instructions,” Logue said. A makeshift sign at Ryder Memorial Hospital warns of mold. Much of the hospital closed as officials worked to repair damage from the hurricane. But many believe Puerto Rico didn't have such structures in place prior to the hurricane, which they say left many hospitals and clinics on their own to deal with the hurricane and its lasting effects. A new report said the federal government was not ready. The Government Accountability Office last week reported on the federal government's response to four 2017 disasters, and said that “integrated planning for some emergency support functions, such as public health and medical services, prior to the 2017 disasters had not occurred.” If better planning had been done, then the responsibilities of federal departments and agencies would have been clearer, the report states. It is unclear whether the Puerto Rico government has completed developing a more standardized disaster preparedness plan that all providers can follow. Levis said she understood such plans have been in the works, but she was not privy to any of its details. At a health conference last month, Levis presented recommendations from her organization to help providers in their planning; the recommendations included creating a culture of readiness through annual training, forming an emergency response team within the hospitals and compiling an emergency contact list of local agencies and partners. But she felt the most important aspect of addressing the island's emergency preparedness needs was for the federal government to provide hospitals with the necessary resources to care for the population's current health needs.